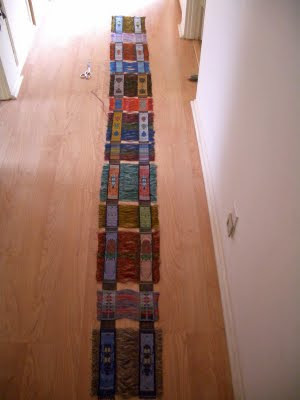 Here are the ten feet of my labors over the past couple of months on my sixteen harness loom. Fourteen beetles and a dozen bookmarks for note cards. I decided to cut the warp and take a look. I was starting to get worried that I was getting a bit crazy with my color selections. I had taken a more methodical approach to color selection as to hue, chroma and value and wasn't sure how they would come out. This more methodical approach was moving further and further from the anatomically correct colors of the beetles. However, I like the end results; more vibrant colors and more stunning designs. I will definitely continue along this path. These are off to the finishing table and the remaining five yards of warp will be reset and be ready for more beetles as well as some experiments with simultaneous contrast. I have finished my first draft of the prologue for my mystery story. I am planning twelve chapters along with a prologue and epilogue. 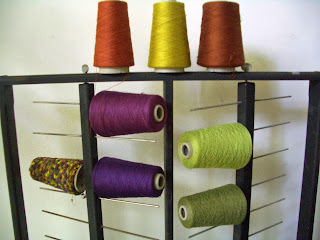 The heroine, a Westside divorce attorney has a loom in her office where she weaves undulating twills to clear her mind and solve issues on her complex cases. 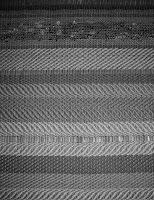 Yesterday I finished weaving the prologue. 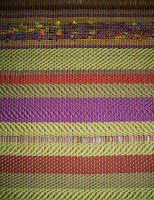 Characters are depicted with weft color while a variety of undulating twills depict actions and atmosphere. In the prologue the characters are doing everyday things until a murder interrupts the peaceful atmosphere. Here's what it looks like in both color and gray scale....and now onto chapter 1. Here are the characters in the mystery story I am 'writing'. Perhaps I will call it the case of the undulating twill. The sleuth is represented by the lemon grass green on the left with the sleuth's sidekick in olive green. The villains are in the various purples. Friends, helpers and innocents are in the the other colors. ps. The colors in the photo are close except for the reds on top. 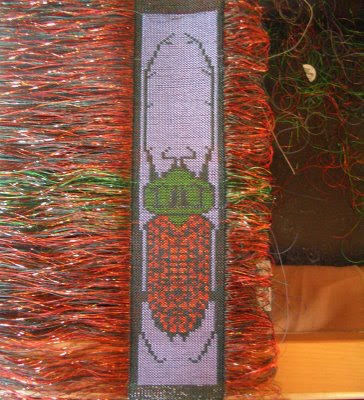 Here is the latest beetle I finished...but I must admit I need a break from beetles so I am focusing a bit on my writing in words and weft project.